The Championship of Morava is one of three regional championships that were held in the Czech Republic this weekend. 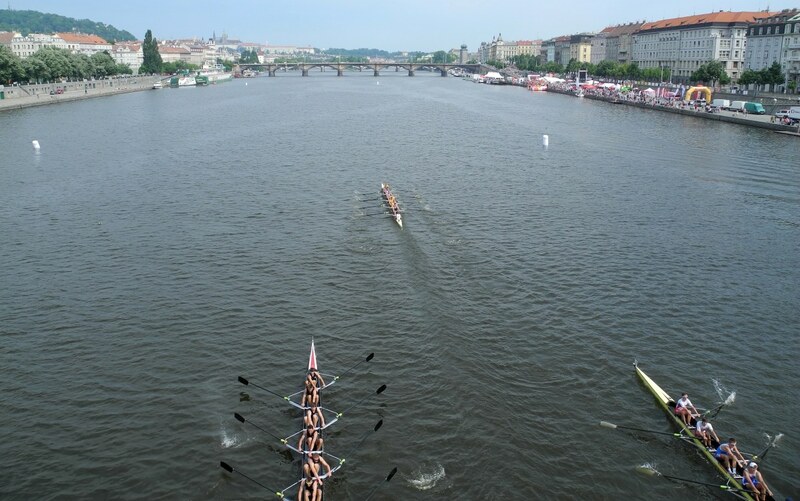 Czech rowing is organised by rivers: Vltava (Moldau) which is mainly the Prague clubs plus South Bohemia, Labe (Elbe) which is all clubs north and west of Prague, plus Pardubice in East Bohemia, and Morava which is our region. Your club’s river is determined by the main river that your body of water is connected to. The championships are closed for out-of-region clubs. The championships are important for the clubs overall national ranking, based on a system where you get 1 point per seat for a last place in the final, 2 points for beating one boat, etc. On these regional championships, clubs use the opportunity to put as many crews on the water as possible. For example, by putting a slow eight on the water, you get 8 points for being last, but your A boat will automatically have 8 points more because it will have beaten an extra boat. For youth, these championships are a qualifying race for the National Championships. The first 8 boats are qualifying, so youth rowed heats on Saturday and Finals A and B on Sunday. Arriving at the club, I learned that one of our competitors in the double had withdrawn. With 6 boats left we would row the final directly on Sunday morning. No racing for me on Saturday. So I took the single for a brief 6km. At 9am, it was already 29C and the expected maximum temperature for the day would be 36C. I did the 3x250m race prep workout that I have described in Friday’s blog. Shortly after that, Lenka and Laura had their heat in the Girls 15/16yr double. They came in fourth, beating one boat, and didn’t qualify for Sunday’s A final. In the B final they would have to be first or second of four boats in order to qualify for the youth Nationals. During the hottest part of the day the boys and I went swimming for an hour, mainly diving from the dock to cool down. It was great fun. Lenka was rowing her single heat during mid day. There were some waves and there was a lot of heat, so race seemed to happen in slow-motion. The girls seemed to be doing 25spm. Lenka didn’t manage to qualify for the A final. She beat one girl and was rowing in the pack but she needed a third place. To be honest her motivation for the single is lower than for the bigger boats. Then I sat in the club house doing some work. Around 5pm, Dominik races his heat in the boys single (<12yr). He came in third place and qualified himself for the A final and thus also for the Youth Nationals. Goal accomplished. Finally Romana and I took the double for a 5km row. After that I did a quick try out of the double with my temporary double partner Jiri for Sunday’s races. It was good we did this 4km round because we found out he had to move the rails and set the oarlock height a bit higher. The day ended with a barbecue. I carefully weighed myself before, so I knew how much I could eat without jeopardizing my LW single final on Sunday. 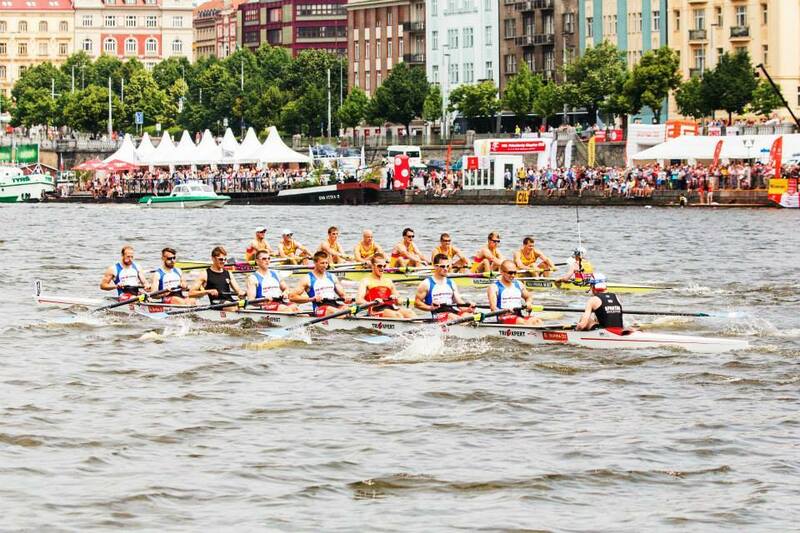 Adding a few pictures from last week’s races in Prague. Our Men’s eight in second place behind Dukla. Fantastic achievement!